Whether you’re new to fishkeeping or you’ve been involved in the hobby for quite some time, chances are that you’ve heard of the pictus catfish. This fish species is unmistakable, offering a distinctive and distinguished appearance that is popular among hobby fishkeepers. 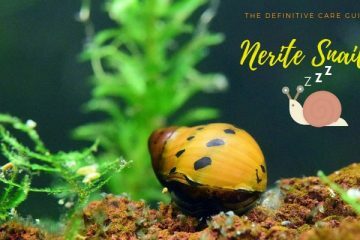 It has an energetic personality and vibrant colors, making it a great choice for your freshwater tank. 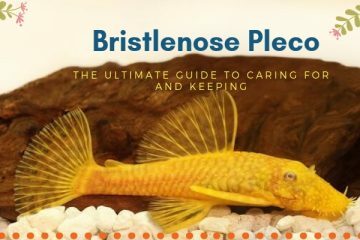 Although it can be on the tougher side for novice fishkeepers to raise, the pictus catfish is a rewarding fish to raise that offers a range of benefits. 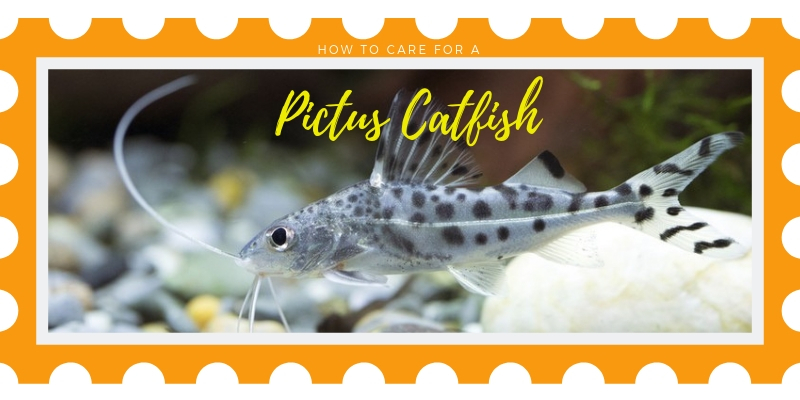 In our comprehensive guide to the pictus catfish, we will tell you everything you need to know, from the size and type of tank required to what you should be feeding your pictus catfish. What Do Pictus Catfish Eat? Is A Pictus Catfish For You? The pictus catfish goes by a range of names, such as the pictus cat and angel cat. A member of the Pimelodidae family, this catfish is one of the most popular of its kind in the aquarium trade. It was originally discovered in 1876 and is native to the warm rivers of South America. The pictus catfish is closely related to another species of catfish that dwells in Africa. This is known as the upside down catfish, a different species known as Synodontis. These fish are generally found in lentic waters, where there is a slow flow of water and the bottoms are covered in mud or sand. Both types of catfish prefer to school. Pictus catfish, however, need clean freshwater and will live in the bottom of the water column. They are most active when it is dark, and use their barbels to catch their prey, which can range from small fish to snails or even prawns. In the wild, pictus catfish are found in the warm riverbeds and streambeds of South America. They tend to hang out in sandy, gently flowing waters. You will need to mimic these conditions in your tank by providing a sandy substrate and a decent amount of current. There are about 2900 varieties of catfish in the world, and very few are from the United States. Most catfish remain small, but some can grow up to fifteen feet in length. The pictus catfish is not native to the United States but remains one of the most popular species in the aquarium trade because it is so attractive and easy to raise. It’s nearly impossible to confuse a pictus catfish with other species, as it has unmistakable features. With a white body and dark black spots, it also has large barbels that reach all the way to its caudal fin. This fish is very active and a fast swimmer, and prefers to be housed in larger tanks (think larger than 100 gallons) where it has plenty of room to swim. Pictus catfish are unique in that they have extremely sharp pectoral fins. You can easily injure yourself on them, and they can also get snagged in fishnets. This can cause damage to the fish, so it’s important that you use a plastic container to scoop your pictus catfish up instead of a net. These fish generally grow up to five inches in length. They are long and slender, and have spectacular whiskers that extend along its face. These are technically called barbels and are a distinguishing feature of all catfish species. 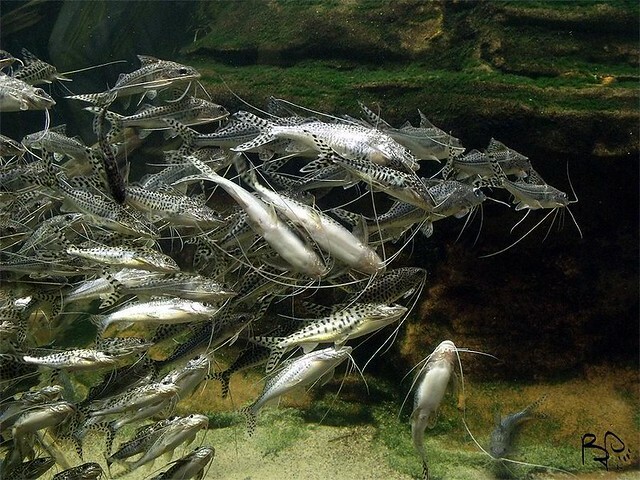 They are used to help the catfish navigate muddy waters, and the pictus catfish has some of the longest. Pictus catfish are also known for having extremely sharp spines and fins. These can damage other fish, so it’s important that you remember this fact when housing your pictus with other fish. This fish will also have a forked tail and a mouth that is large and turns downward. Their bodies are elongated and have dorsal triangles. Male and female pictus catfish are tough to tell apart, but you can tell the difference by looking at their abdomens. Females tend to be slightly larger and more round as they approach sexual maturity. These fish are often confused with Angelicus catfish. While they do look quite alike, you can tell them apart by looking at their barbels. Pictus catfish have longer barbels than Angelicus catfish. In the wild as well as in captivity, pictus catfish exhibit unique behaviors that help them track their prey. 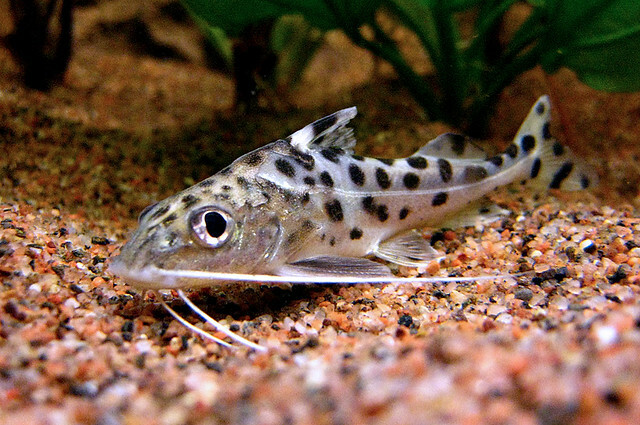 Studies have shown that pictus catfish rely on a number of behaviors to hunt down their food. For example, they use their sense of touch, smell, and taste to detect their prey. Pictus catfish also tend to hunt prey species that are unable to avoid predator strategy, particularly fish who remain calm while the predator approaches. Try to the greatest extent possible to mimic the natural conditions of your species when you are setting up the aquarium tank for your pictus catfish. Because pictus are found in the warm, sandy river beds and streambeds of South America, you will need to provide similar conditions in your tank. Choose a sandy substrate for your pictus catfish, which will help it to navigate as it moves around your tank. 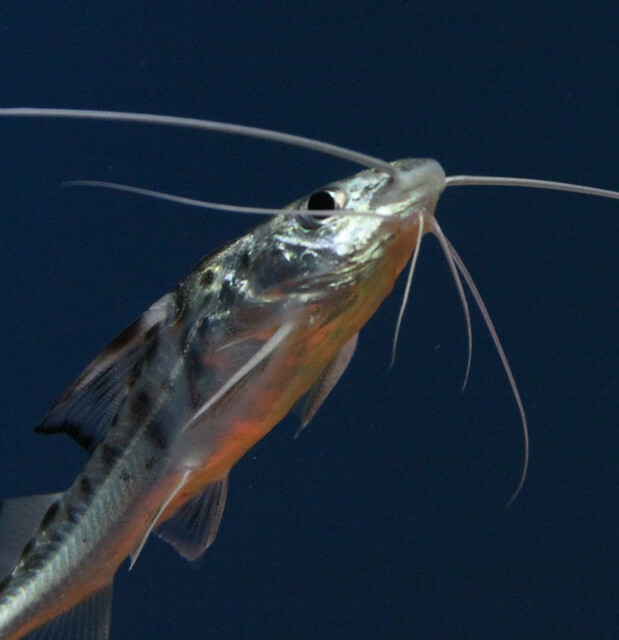 Use a high-quality hang-on-back filter, which will emulate the water flow you need to keep your pictus catfish healthy. A good filtration system will also help remove any waste that the pictus catfish creates – which is no small matter in this case! Filtration will help keep the water parameters of your tank stable. This is especially important because pictus catfish are especially sensitive to nitrates. In the wild, pictus catfish prefer to shoal. Therefore, you will want to maintain a 150 gallon tank which will allow three to four pictus catfish to live together. If you only want to keep a single pictus catfish, which is not ideal but definitely possible, you can get by with a 55 gallon tank. 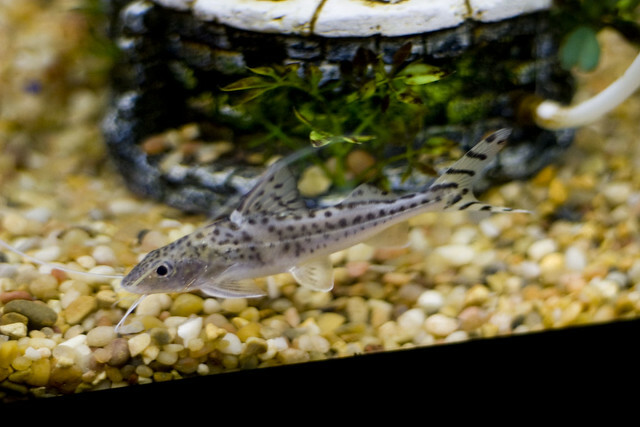 Although they are not large species, pictus catfish are active swimmers, so the more space you can provide them with, the better off they will be. These fish are vulnerable to many common aquarium diseases, so you need to pay close attention to the parameters of the water when you are setting up your tank. Ideally, temperatures in the tank should be kept between 75 and 81 degrees Fahrenheit, and the pH should be between 7 and 7.5. Pictus catfish are incredibly sensitive ammonia and to nitrates. Therefore, you need to be especially careful about performing regular water changes. Too much of either substance can cause major disease in the pictus catfish. Pictus catfish are naturally found in densely planted rivers in the South American forest, so you should try to create similar conditions in your tank. Include plenty of hiding spots, like river rocks, caves, and driftwood, and provide plenty of large open spaces in which your fish can swim and exercise. Pictus catfish are mostly nocturnal, so you should try to keep your aquarium tank in a room that does not receive ample amounts of sunlight. In addition, you should provide minimal lighting in your tank. You may find that it is tough to sustain plant life in such a sparsely lighted tank, but you can compensate for this by growing plants that are easy to maintain in low lighting, such as Java Moss and Hornwort. Other species of moss will also make a good choice. Try to provide as many plants and shaded areas as possible, which will give the pictus catfish plenty of places in which to hide. You can incorporate clay plant pots, artificial rocks, and driftwood in your tank. Your tank’s bottom should imitate a river bed, and you should provide a good, steady current with a circulation pump. Use a medium-type water filter, which will create medium-type water flow. Pictus catfish are scavengers in the wild, eating just about anything they come across. As omnivores, they eat both plant and meat matter in their tanks, so you can feed them a wide range of foods when you are keeping them in your aquarium. In the wild, pictus catfish will eat just about anything, including snails, algae, small fish, and even insects such as dragonfly larvae. They will consume just about anything you drop into your tank, but the centerpiece of your catfish’s diet should be a good pellet food. Because pictus catfish spend so much of their day hiding at the bottom of the tank, you should always feed a sinking pellet. This will ensure your pictus catfish has plenty of time to get to its food and does not have to come to the surface of the water – which it is not likely to do. If you want to change up your pictus catfish diet to provide a bit more variety, consider feeding them alternative foods. Pictus catfish will happily eat different foods like brine shrimp, beef heart, blackworms, and blood worms. You can also feed fresh or frozen vegetables. Keep in mind that any live foods that stay towards the top o the tank will be largely ignored by your pictus catfish. You should only feed foods that will sink. Pictus catfish are not one of the catfish species that are known for their ability to clean algae from your tank, but they will eat small amounts. 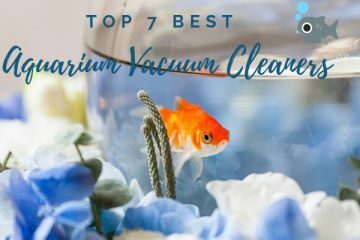 They can help keep your tank clean to some extent, although you should still make sure you are cleaning and changing out the water on a regular basis. Pictus catfish can be greedy fish and they will eat other, smaller fish as well as any food that comes to the bottom of the tank. Therefore, it is easy for them to be at odds with other fish who cannot get enough to eat when your pictus catfish are constantly eating anything they find. Feed high-quality foods, but make sure all of your fish have access to food and not just your pictus catfish. Pictus catfish have voracious appetites, and you should try to keep them full at all times to minimize aggressive behavior toward other, smaller fish. They produce a ton of waste as well, so while feeding in small amounts (but frequently) can help minimize the bioload produced in your tank, you should also conduct bi weekly water changes of 25 percent. It is also interesting to note that the diet of the pictus catfish will change as the fish ages. As the fish spends more time in your tank and enters into adulthood, they will be able to consume more unique foods like seeds, small fish, algae, snails, and crawfish. Larger catfish will rely on larger foods, while those that are small will feed more readily upon plants and invertebrate matter. Pictus catfish are not aggressive and are not particularly territorial. That being said, you cannot house them with just any other type of fish. They have a tendency to eat other, smaller fish when they get hungry, and will eat any fish that is small enough to fit inside their mouths. They are also very active, swimming quickly and energetically around your tank. Therefore, you should prevent adding fish that are slow swimmers (or are particularly aggressive toward hyper fish). This includes cichlids, who are easily annoyed by pictus catfish and can actually be damaged by the catfish with their sharp barbels. Pictus catfish are often marketed as good bottom-dwelling community fish. However, if your tank is packed to the brim with other popular community fish like guppies and neons, you may need to exercise some caution in introducing a pictus catfish. They cannot tolerate small tanks like guppies and neons, and these fish are also too small to be housed with pictus catfish. The pictus catfish should always be the smallest fish in your tank. Remember, although pictus catfish are peaceful, they are still omnivores, and will go after other fish in your tank. That being said, there are some fish species with which pictus catfish cohabitate well. Consider keeping them with other vivacious, energetic species like Giant Danios, other catfish, and Opaline Gourami. You should try, whenever possible, to keep pictus catfish in groups of their own kind. While they can survive on their own without a problem, they are much happier and healthier when kept in groups. Shoals tend to be much more active and outgoing, and while pictus catfish thrive in groups of three or four individuals, you can keep them in groups as large as six – just make sure you have a large enough aquarium to support them. When keeping catfish in a shoal, make sure your tank is at least 150 gallons in volume. Keep in mind that pictus catfish aren’t necessarily aggressive, but that they do have sharp fins and barbels. These can injure other fish even accidentally, so if your tank is overcrowded or filled with slow-swimming fish, this can pose a potential risk. The pictus catfish, like other species of catfish, does not have scales. Therefore, it is more susceptible to many common aquarium diseases. Most of these diseases, such as white spot and ich, are related to poor water quality. 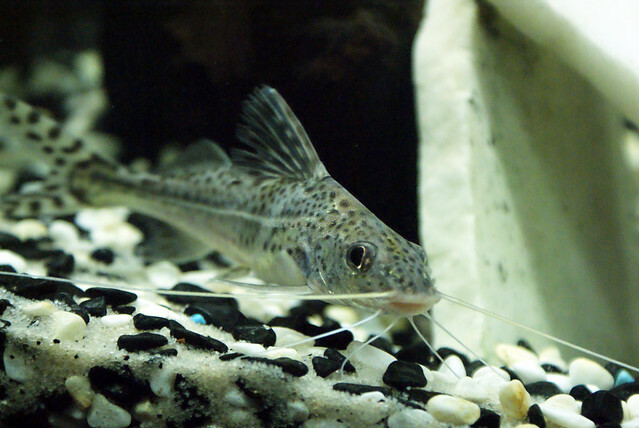 Pictus catfish are very sensitive to changes in water quality, and their health will rapidly decline if they are not provided with the ideal conditions. When pictus catfish are affected by any disease, their health will rapidly decline. They tend to experience diseases that rapidly escalate, and they are susceptible to many surface diseases that are related to poor water quality. Ich is one of the most common diseases and usually causes symptoms such as lethargy, labored breathing, a loss of appetite, and flashing. You might also notice that your fish is rubbing itself against objects in the tank, or attempting to swim near the surface. It also may avoid the rest of the shoal. To prevent ich, you should start by making sure the ideal conditions are being provided. Keep only healthy fish in your tank, and clean the aquarium regularly. Make sure it has plenty of space to swim, and when you introduce new fish species to your tank, only purchase them from reliable, known sources like wholesalers. Try not to buy fish from online retailers, who don’t always have the ideal reputation when it comes to purchasing and selling fish. When you notice an outbreak of ich in your tank, do your best to quarantine your fish as soon as possible. This disease is highly contagious and will quickly infect the rest of your tank if you are not careful. Then, you can treat it with water changes and proper medication. Pictus catfish are very sensitive to nitrates and ammonia, which can cause a range of bacterial diseases. These bacterial diseases can cause damage to the body tissue, heart, and blood vessels of your fish. There are a number of symptoms that can occur with the appearance of a bacterial infection, but the most common are open sores, bloated abdomens, bulging eyes, and discoloration. 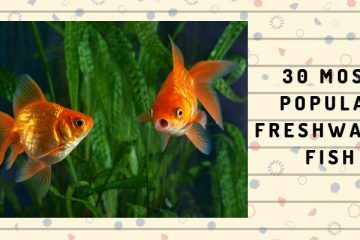 You might notice your fish hyperventilating, or breathing rapidly, gasping at the surface, or swimming erratically. Bacterial infections are often triggered by poor water conditions, typically those with high levels of decomposing organic matter. This causes a spike in ammonia. While you can’t always treat bacterial infections, you can always prevent them by keeping a clean, well-filtered tank. In addition, you can often use a disinfectant solution or an antibiotic to get the disease out of your tank. Mouth fungus is another common disease in fish. This disease is a common bacterial infection that is extremely contagious and often fatal. It causes frayed, ragged-looking fins, along with open ulcers and white, fungus-like patches. It can also cause a change in color in the gills and a loss of appetite in your fish. As with other bacterial infections, you r fish may appear to breathe rapidly. This disease is caused by stress or an increase in bioload. Therefore, you should always carefully monitor your catfish after any stressful period, such as when you first introduce it to your tank. Poor water quality, an unstable pH, and injury can also cause mouth fungus. That being said, the disease is easy to treat for once it has occurred. Although it is highly contagious, if you act quickly you can mitigate the effects of the disease by applying a salt solution of one percent or higher. You can also designate a separate treatment path for infected fish, or apply an antibiotic that is designed to treat gram-negative bacterial infections. The final disease to watch out for is fish tuberculosis. This disease is common in tropical fish tanks, and it’s easy to miss when it has an outbreak in your fish. Once an outbreak has started, you may not notice signs until it has progressed for several years. It is not highly contagious and has no sudden effects. However, signs to watch out for include discoloration of your fish’s body, as well as frayed fins or fin and scale loss. Your fish may develop yellow or dark nodules on its eyes or body. It may refuse to eat and engage in hiding behaviors. This disease is caused by one of several species of mycobacteria and is related to a poorly maintained aquarium. It thrives in low pH values as well as in poorly oxygenated tanks. Once a fish is infected, it cannot be treated. You will need to get rid of the fish before it affects the other members of your tank. An infected tank will be a constant source of infection, spreading the disease to your other fish and causing chronic health problems and poor feed conversion rates. The pictus catfish is particularly difficult to breed in a home aquarium, but that’s not to say that it can’t be done. Most fishkeepers won’t attempt to breed pictus catfish because the typical home aquarium is not large enough to allow the catfish to reach sexual maturity. In order to do so, pictus catfish need a ton of space. The ideal breeding tank will be about 200 gallons. A tank that is smaller than this will not allow your pictus catfish to reach sexual maturity. As a result, there are very few people who have been successful in breeding pictus catfish at home. There is little that is known about breeding the pictus catfish, except for that, in the wild, they are egg laying. The female lays the eggs first and then the male fertilizes them. In addition to difficulties involved in raising pictus catfish to sexual maturity, it is also extremely difficult to tell the difference between male and female pictus catfish. Females are usually larger and more rounded, but besides that, it is nearly impossible to tell the difference between males and females. While the average lifespan of your pictus catfish will vary depending on the level and quality of care you provide for it, most can live for up to four to eight years. Eight years is the maximum lifespan for a catfish, and while it can be difficult for a pictus catfish to live this long, it is definitely not impossible if you provide it with the proper care. There are certain challenges involved in raising pictus catfish. These fish are omnivores, so they will go after smaller, slower-moving fish in your tank. They can easily swallow smaller fish and will do so whenever they are given the opportunity. These fish also produce a high amount of waste, so you will need to clean your tank on a regular basis. They are voracious feeders, so you will need to choose your fish food wisely, and since they do not have scales, they are prone to a number of diseases that may not affect other fish. That being said, the pictus catfish is a dynamic fish that makes a positive addition to most aquarium tanks. 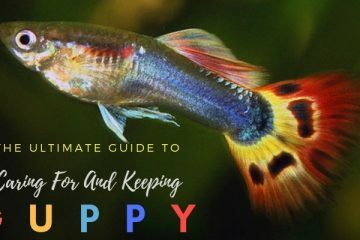 While they do have specific requirements in terms of space and water requirements, they can easily be kept by beginning fish keepers with just a bit of planning and care. With outgoing, energetic personalities, these fish are entertaining and enjoyable to keep. 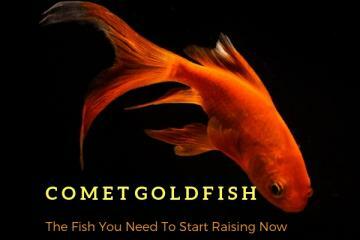 Previous ArticleWhy The Killifish Is the Fish You Should Consider Raising?